We’ll help you celebrate your vows in Aloha style with a beach wedding in beautiful Maui! We handle every detail, so you can enjoy your wedding! we provide all the services you need to set the stage! 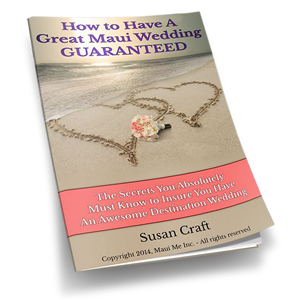 Secrets to a Great Maui Wedding! Affordable Maui Weddings has been performing weddings in Maui since 1998 — thousands of weddings and counting! Why Maui? We believe Maui’s beaches are the perfect destination location for a simple, yet romantic beach wedding. Affordable Maui Weddings is all about quality weddings at very reasonable prices. Yes, you can have an affordable Hawaii wedding in Maui!!! Get our Maui Wedding guide, and get the secrets to having the Maui Beach Wedding of your dreams! We really enjoyed out Maui wedding. It was everything that we were told it would be, both romantic and inexpensive. There were no surprises. We feel you did an excellent job with our service and our photography. 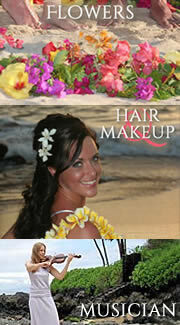 Affordable Maui Weddings is truly affordable and we are recommending you to all of our friends. Our Maui wedding ceremony was awesome and I still get all choked up every time I watch the video. The pictures are gorgeous, the music was beautiful, and the whole day was incredible. We literally didn’t have to do anything but show up to celebrate our special day. I can’t say enough about how pleasant our experience was dealing with you. You took all the stress out of what other brides have said is the most nerve racking day of their lives. We were so thrilled with the pictures and ceremony! Mark and I came home to Oahu and he returned to Iraq about a week ago. Thanks to you guys, we have beautiful pictures and memories to share with our loved ones and help the two of us make it through the remainder of his deployment! Everything was perfect. We wouldn’t have changed one thing. Thank you for making our Maui dream wedding be a dream come true!